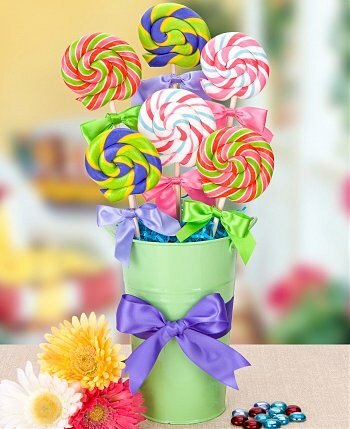 Better than a trip to the candy shop, this nostalgic lollipop bouquet features six swirl lollipops artfully arranged in a colorful metal bucket. These fantastic lollipops are hand-pulled - the same way they were made in the 1800s - to ensure that each lollipop is unique and created to perfection. Six lollipops come in three tantalizing flavors: Pink Lemonade, Sour Grape, and Bubble Gum. The lollipops will arrive individually wrapped and ready to provide hours of enjoyment. Makes a great gift for birthdays, thank yous, or for anyone who deserves a special sweet treat. Color of container may vary. Measures 6" x 15". Complete the personalization option and we'll print your message on a satin ribbon. One line with up to 45 characters; requested text repeats across entire ribbon. A personalization charge will be automatically added to the total when the personalization option is selected. Sweet Shop Lollipop Bouquet is a hand delivered gift. These gifts are delivered by one of our local design centers located throughout the United States and Canada. Same day delivery is available for most gifts when ordered before the cutoff time. The cutoff time for Sweet Shop Lollipop Bouquet is in the recipient's time zone.